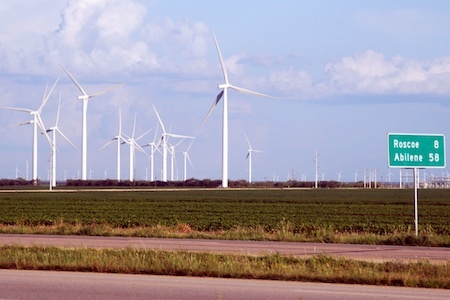 Kate Gailbraith, a reporter for the very accomplished non-profit and online Texas Tribune, has a report from the Lone Star state about grassroots opposition to a new $5 billion transmission line to carry power from all those windmills down there. Texas is the largest wind generating state in the country, with a capacity of nearly 9,500 megawatts at the end of 2009, or roughly equal to 10 big coal-fired plants. Opposition to new transmission lines, as Mode Shift reported earlier this year, is becoming more common and impeding development of the low-carbon power that will help temper climate change. “As Robert Weatherford’s Ford Expedition climbs and dips through the Hill Country, over creeks beds and past oak-covered slopes, he explains the sensitivities of the residents who populate this rugged yet placid area of Central Texas. “These are the kind of views people are willing to pay a little bit more for,” he says. Weatherford and others in this scenic slice of the state fear that those views — not to mention property values — are threatened by gigantic power lines needed for the transmission of wind power. The Lower Colorado River Authority, or LCRA, wants to build two high-voltage lines through the Hill Country as part of a $5 billion project to carry electricity from West Texas windmills to Central and East Texas homes and businesses.